The University of the Free State, Bloemfontein, was the host for the 2015 congress. The theme of the congress was Imaging in Radiotherapy. Several international speakers presented, including Prof K Tanderup and Prof M Stock. This week long meeting consisted of a pre-congress workshop on 21 - 23 September 2015, the SAAPMB congress on 23 - 25 September 2015 and concluded with a expert scientific meeting 25 - 27 September 2015. 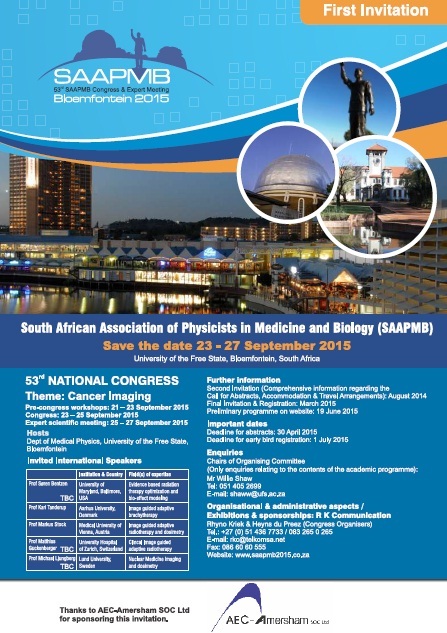 For more information visit the official congress website www.saapmb2015.co.za.